I am not a full time traveller anymore. I do not get up at the crack of dawn on Monday morning to go to the airport and I don’t get to spend the week at some _____ (read: exotic, weird, boring, dirty…) destination. In 2014, I was just like any other passionate traveller with an anchored full time job and relatively limited holidays. They say when there is a will there is a way and usually, nothing can stop me from booking a trip once the idea and the time off is inked in my mind so I still went on several trips most remarkable of which were the Trans-Siberian train journey, the Naadam Festival and Nepal. For the whole year, though, there was a trip I have been looking forward to more than any other: a 3 week Pacific island-hoping adventure starting in New Zealand and on to French Polynesia and The Cook Islands during Christmas and New Year’s. This trip was particularly special not just because of the amazing destinations (yep, New Zealand so far has not disappointed the tiniest bit) but also because I had planned it all two years earlier and had to cancel because of work. Everybody likes a free stay and flights so, to finally use the points I had accumulated living at the Intercontinental Manila for over two years, we had to book the stay at the dreamy Intercontinental Thalasso Spa early. How early? Well, we booked in May when already some of the nights were not available! What about the flights? We also wanted to book the long-haul Singapore-Auckland with points and, as it was peak Christmas season for Kiwis flying home, we booked those around the same time too. From Auckland, we had no choice but to purchase the tickets to Tahiti. Even so many months in advance, the only way to find reasonable fares was to fly when nobody else would fly: on Christmas Day. Truth be told, it did not matter too much because we were going to spend it with his family for whom Christmas is an informal and casual celebration, so we went for it. When my relationship ended I was faced with the dilemma of choosing between canceling the trip or carrying on solo. As an experienced traveller, spending time exploring places alone is not a daunting thought. I have been on numerous trips by myself including 2 months in the Pacific. I find that solo female traveling opens the doors to lots of experiences you just don’t have when traveling with other people. And it affords a lot of time to reflect, what better way to end the year then? My only concern was spending such a friends and family oriented time of the year, not only by myself but surrounded by couples on their honeymoon! This was indeed a scary thought. When I was traveling around the Pacific I often got the “puppy look” – that face other people give you when they feel sorry that you are alone. I had to explain, almost on a daily basis, that I was traveling solo by choice and that I was very happily doing so. Still, most people invited me to their table for dinner. Don’t be cheeky, we are not talking guys trying to pick up a girl but elderly women, families, locals or groups of friends. 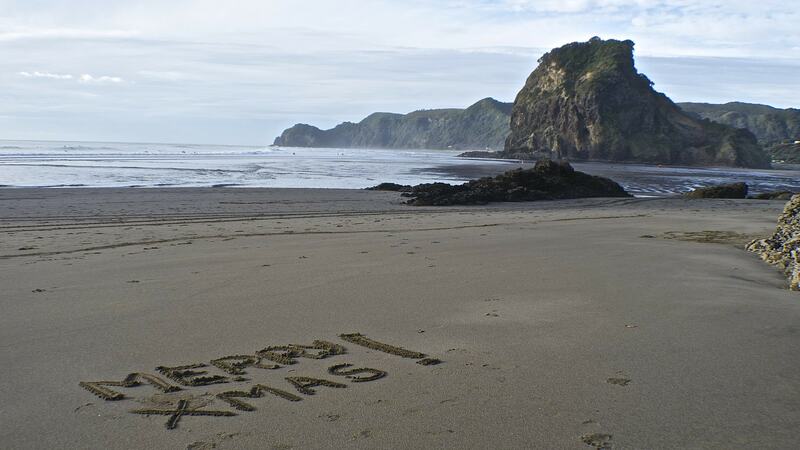 So here I am on the 23rd of December, 4 days into the trip, having road-tripped around the North Island for as long and about to publish this post. I still have no idea how my Kiwi Christmas will look like. It could be spent at the airport, surrounded by many other people who may also be away from their loved ones, or it could be spent with an improvised picnic by the Harbour, a hidden beach or a park in or around Auckland. Who knows? One thing I am sure of, wherever I am, I’ll have the best company possible: the many thoughtful messages from friends and family all over the world who will, just like any other year, think about me. It is the best part of a semi-nomadic life to have friends scattered across the globe and, this year, more than any other, it will remind me of the great people I met through the 10 years as an expat. It will start with my friends living in Australia, New Zealand and Asia, who will wake up in the morning and catch me while I am still in Auckland. By the time I take-off, most of my European friends will still be asleep. Landing in Tahiti, where it will still be 24th December, Europe will be fighting off the bedsheets. In Spain, we do not exchange gifts on Christmas Day but on the 6th of January so most of my friends and family will simply wake up and get together to cook a gigantic meal which will extend well into dinner. I will miss the “turrons”, the “neules” and the “escudella”, our typical Catalan Christmas meal. This is the first year I don’t spend Christmas at home. By the time I wake up on my second Christmas Day, in Tahiti, my American friends will be warming up to the day. In Europe, the evening will be settling in and some of my friends may go out to the local community centers to play bingo. I have no idea how my Tahitian Christmas will look like either. I may rent a scooter and cruise through the island or simply chill with a mojito. I will leave that one to destiny too. In all this madness and virtual voyage across all 6 continents, of one thing I am sure, through the two days of my Christmas, there will be someone, somewhere around the world, sending me merry, happy wishes of love and hope and reminding me that I may be spending Christmas by myself, but I certainly am not spending it alone.